So I know many of you hate Ferrari, other's like me love it. Now, I'm not only taking about the street cars, since Ferrari was initially conceived by dear ol' Enzo for racing, and it has at least always remained true to its roots. Sure you can blame them for enhancing their road cars for the press tests, but you can't really do the same in multi-brand racing (bar clever engineering/use of loopholes). Ugh, legislation! Now the bigger question is whether the Team have actually used it and when. Though in there defense even with such power they where unable to stop the switch to the Turbo charged V-6 engines of next season, a move which they have always outspoken about. In fact, I think they have always complained when the sport slowly downgraded from the glorious V-12 to V-10, and then from V-10 to V-8. So I guess in a way, its been a power that has not been used, or maybe it was used in threat to delay changes. Lets not forget that the Scuderia remains the smallest engine manufacturer in F1 and such changes are always costly on the development side. I'm assuming this was a way to protect from Bernie as well, as the team has always been adamant about leaving the championship a few years back because the distribution of money was clearly in favor of the CVC and not the teams. By vetoing or threatening to do so, the upsetting teams could always further pressure and support such claims. 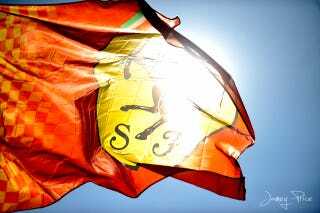 It could also be a clever way to tie Ferrari to F1, with a Veto that holds almost no meaning. Imaging the teams deciding on the downgrade from V-8 to V-6 turbos. So Ferrari is clearly in opposition, all other manufacturers who are trying to comply with ever tighter regulations and expanding/reinforcing their segments are in favor. So Ferrari veto's the move, all teams get up in arms about it and threaten to leave F1 since its not technologically viable anymore. Well Ferrari can't compete alone (the Indianapolis debacle might prove me wrong). So they all end in a compromise, most likely a delay in the implementation of the changes. Same would happen the other way. Put yourself in Bernie's and Mosley's shoes, wouldn't you grant them such a concession in order to keep them happy as you reign in the cash? Do you actually think Ferrari will ever leave F1 if they lost such a privilege and risk their heritage? Well, I guess F1 politics can be as interesting as Game of Thrones. And if I didn't make it clear, I am a Ferrari Fan. I always root for the team; as for the Driver's World Championship, well that's another story: 2007 was a Great Year (always have been a great fan of the Kimster since his Sauber days and even when he challenged Kaiser Schumi in his stint at Macca). I'll leave you alone to the comments.